The most impressive display came in the under-17 men’s race, where the club had the first five runners home. Over the six-kilometre distance, it was defending champion Adam Searle that strode to victory. The English Schools 1500m steeplechase winner, who was ranked the UK No.1 for his age group in 2017 at the event, recorded a time of 21 minutes and 13 seconds, 20 seconds clear of the chasing pack. Muss-Ab Hassan followed him home for the silver, with Matthew Chronicle closing out the team in 21:52. The top five was completed by Adam Caulfield (22:07) and Ben Hope (22:51). Almost matching their performance were the U11 boys, who had four runners cross the line within 11 seconds of one another. Ollie Walls, in 7:05, took the title by two seconds over the 2k course ahead of Nathan Lamb, with bronze medal winner Zac Pasqualin a further two seconds back. In fourth place was Benjamin Westmoreland-Alexander, finishing in 7:16. The U11 girls saw Ella Darby (7:17) win the race by four seconds from her team-mate Lara Turner, and the winning squad was completed by Lucie Caulfield in fourth spot with 7:56. The senior ladies’ race over 6k saw a brand new champion when Gabriella Moriarty triumphed convincingly. The 24-year-old recorded exactly 24 minutes to finish well clear of her junior clubmate Emma Bond, whose 24:37 earned her the U20 gold medal. With Bethan Goddard clinching sixth position in 27:09, R&N regained the ladies’ team title they last won in 2015. In the U15 girls competition, Claudia Searle made it a family double by taking victory over the 5k route with a time of 22:03. Further strong performances from Amelia McMurtrie (fourth - 23:31) and Holly Walker (fifth - 23:50) ensured another team title. Amy Walker won silver in the 6k U17 women’s race when she recorded 25:54, but claimed a team gold with the successful squad of Lucy Stevens (fourth - 27:44) and Abigail Pearce (fifth - 28:54). Noah Bennett led home the U15 boys’ winning team when he took the bronze medal in 19:57. Backing him up were Lewis Panter (fourth - 20:09) and Jake Hope (fifth - 20:52). The senior men successfully defended their title with Dominic Jones just missing out in a close race with defending champion Jonathan Goringe of Kettering Town Harriers. However, he still took silver in 35:27 over the 10k distance, just seven seconds adrift. Joining Jones in the six-man R&N team were Phil Melling (fourth - 37:27), Ben Musgrove (sixth - 39:00) winning the U20 title, Brendan Moen (14th - 41:37), James Wizard (17th - 42:10) for U20 silver and Vince Carroll (26th - 44:04). The U13 races were over a distance of 3k where, in the girls section, Alice Bates led home the R&N team to gold when she recorded 12:59 to finish in second place. Olivia Williams crossed the line in fourth with 13:14, and closing off the team was sixth-placed Abigail Thayanithy in 13:25. The club also took home team silver in the boys’ race, with Jasper Cooper leading the way as runner-up in 12:05. He had support from Louis and Jenson Buttrick in third and eighth respectively, with the former timed at 12:09 and the latter 12:31. 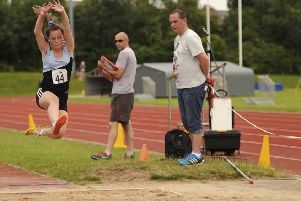 R&N’s weekend success continued in Birmingham, with several athletes competing in the Midland Open at Alexander Stadium. Florence Matthews was one of the standout performers, making a fine start in her first competition in the U15 age group. She recorded personal bests in the long jump (5.04 metres) and the 60-metre sprint (8:60). Fenton Bishop-Timings went one better, setting three PBs in the field. A javelin throw of 46.85m was accompanied by 30.84m in the discus and 11.84m in the shot. Rounding off a busy weekend, Annabelle Pask was in National Championship action in Sheffield, competing in the Senior Women’s EA Indoor Multi-Events Championship. She made a strong start to the event, setting a new club record of 3325 points in the pentathlon.